After hearing a rumor about new frostys, it dawned on me that it is infact a new month and time for a new blizzard, yay! I did a quick search but couldn't figure out what the new blizzard could be. You know what that means, time for a field trip! German Chocolate Brownie? Nice, haven't heard that one before. With Pecans? OK. With Coconut? wait, what? ooooo, I despise coconut.... but it's my job to try these things.... I hope everyone appreciates my sacrifice here hehehehehe. Yeah... that's not what I was expecting. There are toasted coconuts everywhere, most of the pecans have been obliterated into specs, and I don't really see the caramel swirl (though I did find it later). You can't see them in this picture, but there were tons and tons of brownies in this blizzard. Now not only was I surprised by seeing something truly new on the menu, but I was also really taken back by the taste, or should I say, the subtlety of the taste. The pecans, caramel, and coconut have come together in this friendly, semi-sweet, and unobtrusive combination. It's one of those flavors you can't describe, yet you know you like it from the very first bite. I kept trying to discern each ingredient, but it just wasn't meant to be. The closest I came is when I accidentally got two whole pecans on my spoon, and that only happened once. I blew through this blizzard in no time at all, and that includes having to get through the somewhat chewy brownie chunks. I'm still surprised that the coconut was so mellow. I would say they forgot it, but I could literally see it everywhere as I made my way to the bottom of the blizzard. Maybe complex is the right word to describe this new flavor. No matter how badly I describe it, I have to say nice job DQ making a happy, cozy, mellow blizzard DQ, your efforts are appreciated. This looks good. Ben & Jerry's just came out with a german chocolate cake inspired flavor. It's called Fair Goodness Cake! Its Chocolate Ice Cream with German Chocolate Cake Pieces & a Coconut Swirl. It's a Limited Batch flavor, so get it while you can. BTW, if you do find it please tell me where, because i can't! Ooh yum this looks nice, love the sound of this, you get so many interesting sounding treats yum!! @courtney: i will keep my eye out for it! @lot-o-choc: you still have mcflurries right? any other competition? 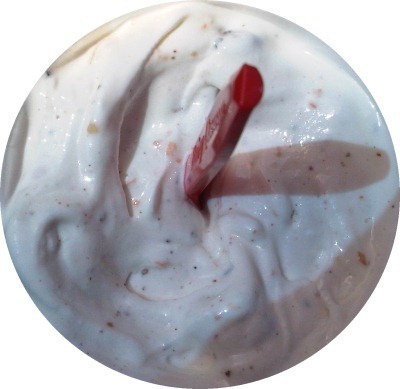 @Courtney, I think that's still a test batch in scoop shops only, but I could be mistaken. @Dubba, thanks for the heads up - I'm a big time coconut fan so I may have to grab this. I had this blizzard tonight and thought it was a great new idea..loved how smooth the coconut taste was, and all the brownies/pecan/coconut that collected on the bottom were sooo good. Turkey Hill has a limited edition German Chocolate Cake flavor that I think is still better though!